Former Wheaton Provost Susanne Woods, surrounded by Wheaton students and flanked by Meghan Dias Rae ’04 to her left, and Melissa E.K. Matsubara ’01 to her right (Blog Post #7). 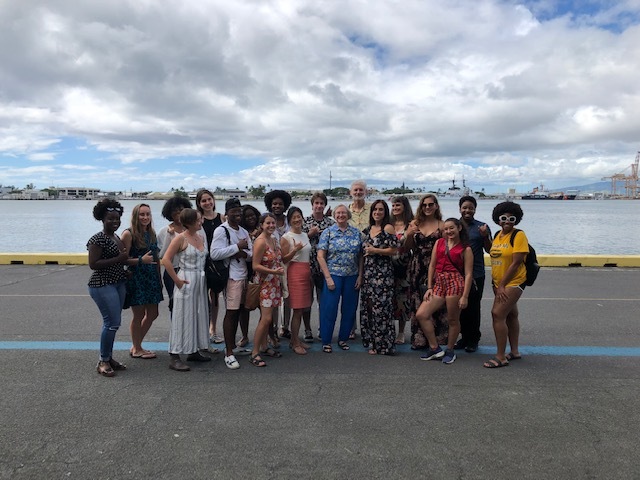 On Thursday November 1st the Wheaton group rode Da Bus downtown to the harbor-side campus of Hawai’i Pacific University for lunch at the invitation of Dr. Susanne Woods, who served as Wheaton College’s Provost from 1999-2006. Susanne was lured out of her retirement to cross the ocean and serve this year as HPU’s Interim Provost and Academic Vice President. We know how lucky Hawai’i Pacific is to have Susanne at the helm of academic affairs, and she clearly thoroughly enjoyed once again being surrounded by Wheaton students. In the photo, standing to Susanne’s left is attorney Meghan Dias Rae ’04, a music / theatre double major and co-founder of Wheaton’s acapella group The Blend. To Susanne’s right is Melissa Matsubara ’01, an anthropology major who is now the Director of Study Abroad and International Exchange Programs at Hawai’i Pacific University. Melissa has been graciously helping some of our students to think through their independent study projects. Here’s a toast to maintaining close links between Wheaton people on the mainland and on the islands!